Scientists have made a significant step towards developing fully artificial life – for the first time, they demonstrated evolution in a simple chemistry set without DNA. In a way, the researchers showed that the principle of natural selection doesn’t only apply to the biological world. Using a simple a robotic ‘aid’, a team from the University of Glasgow managed to create an evolving chemical system. 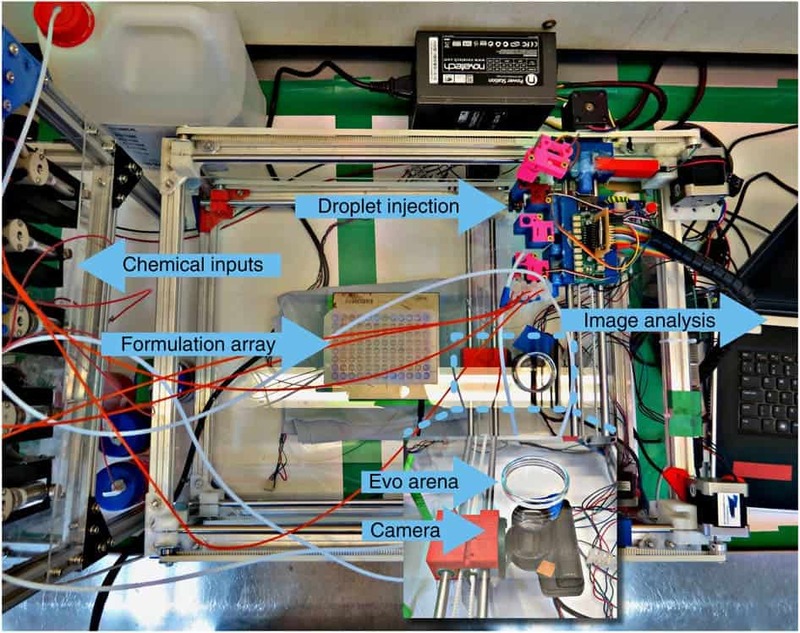 They used an open source robot based upon a cheap 3D printer to create and monitor droplets of oil. The droplets of oil were placed in water-filled Petri dishes, and each dropled had a slightly different mixture of 4 different chemical compounds. Photographs of the droplet behaviour as a function of time (from left to right) for all the traits (given in a–i). Image credits: Cronin et al, 2014. The robot used a simple video camera to monitor, process and analyse the behaviour of 225 differently-composed droplets, identifying a number of distinct characteristics such as vibration or clustering. The team focused on division, movement and vibration as parameters to study evolution. 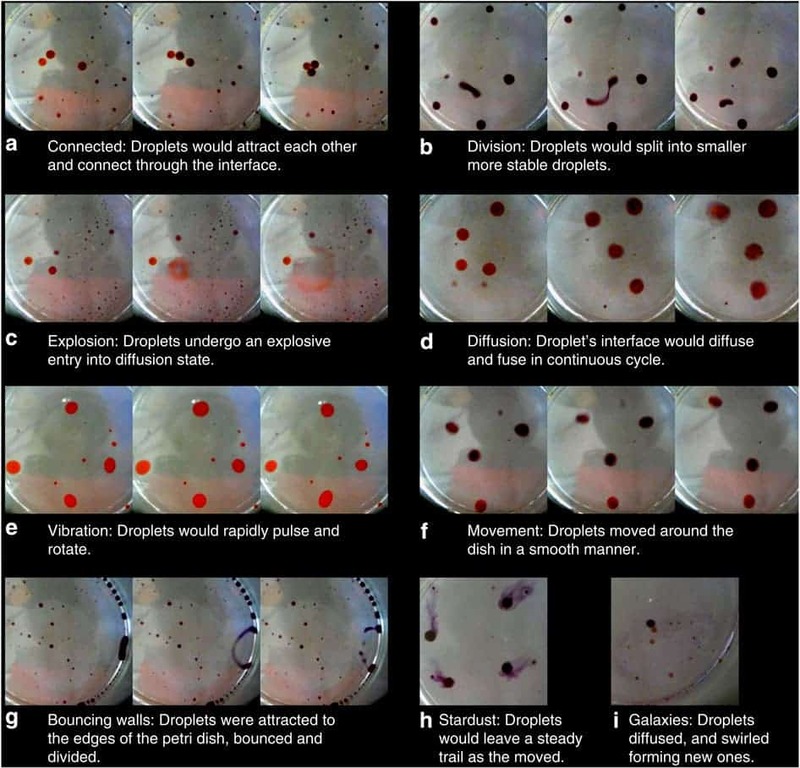 They used the robot to deposit populations of droplets of the same composition, then ranked these populations in order of how closely they fit the criteria of behaviour identified by the researchers. They then created a new generation of droplets, with the best matching (“fittest”) composition carrying on to the second generation. After repeating this process for 20 generations, they found that droplets became more stable, mimicking the natural selection of evolution. “This is the first time that an evolvable chemical system has existed outside of biology. Biological evolution has given rise to enormously complex and sophisticated forms of life, and our robot-driven form of evolution could have the potential to do something similar for chemical systems. Photograph showing the pumps: cleaning and oil phases, the mixing array, the syringe array held in the X–Y stage, the evolutionary arena, the optical imaging system held below the evolution arena, the motors controlling the X–Y carriage and the computer interface. Image credits: Cronin et al, 2014. This is not the first time evolution has been demonstrated outside of biological systems. However, it’s the first time it has been done in the physical world. By this I mean that evolution has often been emulated in software.